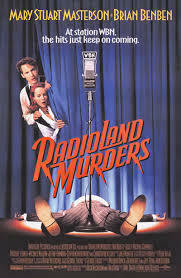 RADIOLAND MURDERS rolled over and died when it was released. Written and produced by George Lucas the film was a loving throwback to the 1930’s and 40’s movies set in and around a radio station, the problem was audiences in 1994 didn’t want to see it either because they were scared away by less than stellar reviews or they had no clue what the film might be. The film is a madcap romp mixed about the first night of a new radio station. Everyone is trying to make sure everything goes smoothly in order to impress a new sponsor. Unfortunately there’s a murder and as a result craziness results as the idea that the show must go on collides with the search for the killer. If you like the old musical comedies of the 30’s and 40’s like those done by Abbott and Costello, Bob Hope or Jack Benny then you’ll love this. Hell it has Rosemary Clooney and George Burns in performance cameos. Actually if you just want to put your worries aside for a couple of hours this is the film for you because very funny and extremely entertaining. While far from being one of the great films of the 1990’s, it is one of the most unjustly forgotten. RADIOLAND is one of those neat little gems that just entertain the hell out of you and become a stopping point whenever you run across it on cable. Sadly this film is out of the current rotation despite its sterling cast and George Lucas parentage.